Thank you all so much for your comforting words on my last post, I am feeling so much better already, somehow just saying it, or rather writing it down, made it seem so much smaller and less overwhelming. At the moment good days out number bad and looking for things that make me happy every day really helps so I am feeling positive that I can banish these blues quickly. A particular "hello" also to Astoria who was commenting for the first time and is a recent knitting addict, thank you for your very sweet comment and I am always very happy to hear of new knitting addict/convert, coincidently I am knitting a bamboo camisole myself at the moment, pictures soon. Just what Kim said! Although I love the apron I was distracted by that view! IS it your backyard? Thank you, thank you!! I have spent ages looking for an apron pattern that I like that looks simple enough for a new sewer like me to try. Yours looks lovely. Love the apron - I've got that book and am waiting to find some fabric for the apron - and a number of others (why are aprons so addictive to sew?). Oh I think I need one of those... or perhaps three. Is it just cotton? I have a quilt fabric stash which could yield lots of possibilities. 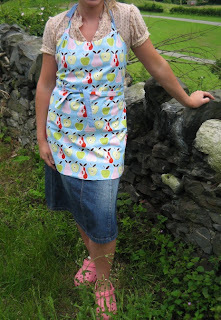 very cute apron, I love the pear fabric. I'm really smitten with the backdrop, that wonderful stone wall and all that green green! To me that seems the perfect place to live! You are definitely quite the little seamstress if I do say so myself. The apron is so adorable! I'm so happy to hear you are banishing the blues. Hey ! My kind of woman on the stick it behind the sofa front. We once famously had an unexpected visit from the sister of a good friend - who subsequently asked the good friend if we had been burgled as our house was in such chaos ! Heh ! Heh ! We like it like that .... seriously in my defence, I had been looking for something long mislaid so had turned out an entire cupboard on the hall floor ! What fantastic photos of your apron and the countryside too. Just beautiful. I love the blue apron with the pear fabric, and I just love that fabric and have seen it in some other blogs too. One day I will hopefully find some here to buy. I would be too scared to make an apron though, as I am sure my foodie marks would stain it and it wouldnt be as nice anymore. I love your apron, I need one that crosses over at the back as I always wipe my floury hands on my bum! I too am a stick it behind the sofa or in the hall cupboard kind of person, it has made packing this apartment interesting and I am worried as the new apartment has no hall cupboard. Oh I do love a nice apron - I come over all Anthea Turner and efficient! Unfortunately i am well overdue for a nice apron so the house is in a complete pickle! You have inspired me. Glad to hear that you are feeling better. Love the apron - need to get round to making some too. Am fed up with cooking splashes on t-shirts and too need somwhere to wipe messy hands. Beautiful views in the brackground. I take it that is the view from your house? It makes me quite homesick to see how lovely lush and green everything is this time of year. Sorry I am so late commenting on your post. What a great idea, a reversable apron. I have to admit I hardly ever wear one, so I have to have some powerful stain removers in my laundry room! I noticed your pink footwear. Perhaps they're Crocs? They are very popular here, in all their bright colours. I also wanted to comment on the beautiful scene behind you in the picture, the stone wall and the green fields. I would so enjoy painting it. Glad you're feeling better and finding some joy in each day. You crack me up! Your apron is adorable but the turning it inside out thing is hilarious! One of my husbands roomates when he played football used to turn his underwear inside out if he didn't have another clean pair to wear! Aaaagh! And---ohmygod--is that your yard? Lovely!!!!! I have been considering that book, now I know I need it. Your apron is gorgeous. I love reading your blog it is always inspiring. I was only looking at that apron pattern in the book today, I'm not sure there are many patterns in the book that I really love, but I do like the apron and the sunhat!What I really like is the design of the book, it 'feels' nice...it looks like a really useful garment to me. I love the way you model your clothes too, very demure!